Next post: Could Low Wii Supply Drive Up Demand for Its Competitors? This is a collective post. I’m going to start off with the best personal finance practice I’ve run across this year. You post in the comments with something you’ve learned from a blogger/book/friend or something you’ve come up with yourself. Sound good? As you post comments (or e-mail mrsmicah at that gmail place dot com), I’ll add them to the post. Complete with a link to your blog (unless you’re a spammer). Or link to me from your own post about it and I’ll add the link and a teaser to the post as well. Well, if you didn’t guess it from the picture, it’s the debt snowflake, a technique I learned from Paid Twice. She uses it to drastically reduce her debt. I have a set amount I pay to debt without fail every month that is above my minimum payment due (about $800). On top of that, I also try to collect up little bits of money wherever I can and I apply those as well to my top priority debt (my credit card). I take surveys online, I sell possessions on craigslist and ebay, I have yard sales, and any money I get from these endeavors goes directly to my debt. I also keep a very strict accounting of all the money that comes in every month and what I spend and everything left over at the end of the month not earmarked for future expenses also goes directly to debt. 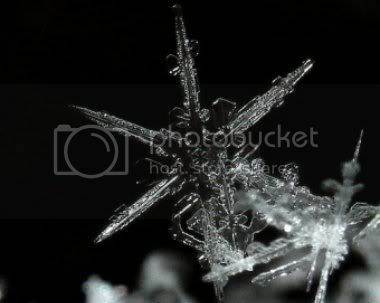 These are my snowflakes. I have averaged over $200 extra going to pay down my credit card debt every month due to these snowflaking efforts. I think this is brilliant. It’s making her snowball larger and larger as it attacks the debt. But she doesn’t have the pressure to pay more than she can afford, either. She just pays it as she gets it. You can use the same sort of thing to snowflake together your savings, or put money aside for Christmas. Little by little, she gets the money to make this work. I really admire her dedication! And here’s a link to today’s post (which inspired me) about 5 golden rules of snowflaking. I won’t spoil you by clipping from it. If you’d like to see all her snowflaking-related entries, here’s a link to her snowflaking categories page. Now tell us, what are the best PF practices you’ve come across this year? From Finance and Fat — Charge Yourself Exorbinant Banking Fees. From Being Frugal — Think Outside the Box! A month or two ago I started keeping track of all of my income & expenses on a spreadsheet. I’m pretty responsible with my money, but that doesn’t mean that I always know exactly how much goes where. Now I can keep track of what I’ve spent or made, sorted by categories, and budget accordingly (now that I have a proper idea of how much I actually make and spend). This year I also set up an automated monthly move from my chequing account to a savings account I’m not allowed to touch. It’s not much, but it’ll compound, and this way it actually gets done. [Mrs. Micah writes:] I’m not even attempting a summary. It’s incredibly complex and amazing. Somehow, they keep all their balls in the air. Don’t try this at home unless you’re super-organized. But it’s worth taking a look just to be impressed by their juggling act! So far they’ve made/saved $11,590! This has directly led to us having less arguments about “where we are budget wise” and saving apx $400+ a month by sticking to the budget. More on my site. This comprehensive post has tips on automating banking, bills, retirement–everything! Great ideas for getting your finances running in the right direction with less effort on your part. So hurry on over. In desperation, I switched my budgeting from monthly to weekly and keyed the weekly budget to a cycle corresponding to the credit card I use the most, whose billing cycle closes on the 20th. Without a doubt, it was living on my old salary (the one from three, four years ago), and banking the difference weekly. I save much, much more money this way and barely miss the difference. What a great idea to collect ideas! I think I need to try Frank’s idea and Kris’s idea. Anyway, here’s the link to mine. Good quality items can last for years, so I always make it a point to buy the highest quality which may not necessarily mean the highest price. Although it requires a larger initial outlay, it is less expensive over the years and I enjoy it much more than the stuff that need to be replaced annually. Here’s a link to my blog about it: http://earlyretirementextreme.blogspot.com/2007/12/own-quality-not-quantity.html. Very informative! love the collective info idea. And thanks for bringing snowflaking to the forefront. It’s such a great concept. I’ve enjoyed Paid Twice’s info on this too. I’ve learnt this on many personal finance blogs all year round, most lately on bripblap in his post on whether it’s worth going to college or not. Mrs. Micah, thanks for adding my post. @plonkee: “It’s not what you make, it’s what you keep.” That’s one of my mantras. It’s so true. I remember my mom telling us that many, many, many years ago. This has directly led to us having less arguments about “where we are budget wise” andsaving apx $400+ a month by sticking to the budget. More on my site. And one good link deserves another!Linked back to you from mine. Great post idea! Mrs. Micah! Congratulations on making Consumerist! Lol, David. Those are the two big ones–but I hope this can compile ways to earn more and spend less. My best PF practice of the year was setting PF Goals. I realized that having a goal in mind makes you work that much harder. Meeting you goal or even coming close gives you that much more motivation! Best thing I came up with this year happened when Our Beloved Employer switched from bimonthly to biweekly pay. This disconnected my income from my monthly bills, posing a serious risk that too little cash would be available to cover living expenses between the 1st and the 31st. With each paycheck, I leave enough in my checking account to cover 1/2 of recurring bills (utilities, insurance, etc.) paid with automatic deductions. I move 1/2 of the amount I think I will charge on the card for food and daily necessities into a money market checking account (earns a little interest, but you can only write two or three checks a month). Then I budget a specific amount for each of four “weeks” (actually a little longer than 7 days) starting on the 21st and ending on the 20th. I have all my automatic deductions for utilities and other recurring bills made on or after the 20th. So far, this has meant that two paychecks always contribute to the amount needed to cover those expenses, providing enough to cover them. This is working. If I spend all the amount budgeted for “week 2” before the end of that period, I delay new purchases until “week 3” starts. A day or two of living purchase-free is no deprivation, and it guarantees that I do not overspend my income. If I hold off buying anything on the 20th, all that billing cycle’s charges will clear on the credit-card statement, & so I’ll have no problem paying the card in full and I start at 0 for the next cycle. This allows me to put $300 aside for property taxes, homeowner’s insurance, and car insurance; pay $250 toward principal on a small home improvement loan; put $170 a month into personal savings; and still have a few bucks left over at the end of the month. It’s a miracle! Thanks for your post–very inspiring. I just wrote a blog, â€œHow Resolutions Will Save AND MAKE You Money,â€ that features related money making ideas. Itâ€™s a great idea and I hope people take advantage! In the old days when cheques were used more than online banking, I used always to “round up” to the nearest 5 or 10-cent amount when I balanced my chequebook. That is, if the amount was $15.47, I’d subtract $15.50. And anything over $15.85 became “$16.00.” Those “virtual pennies” added up (and saved me a bunch of aggravation because I don’t like math)…and at year end, you’d be surprised how much you can then transfer to either paying something off or sticking into a savings account. You can’t tell exactly how much the amount is unless you’re keeping track (not my thing) but you can take a pretty good guess. I know it doesn’t work for everybody, but it worked for me. My best tip, though, is…don’t spend it if you don’t have it or don’t have a way to earn it. I’ve been poor and it’s not fun. And…read all the catalogs you want, turn down the pages, and then…throw them away!